The harrowing picture to your left depicts murdered teenager Michael McIlveen's mother Gina carrying her son's coffin at the boy's funeral yesterday. 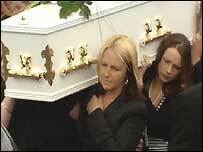 The Catholic teenager died last Monday, the day after being attacked by a gang in Ballymena. The boy's death was a tragedy but it has been most heartening to observe the response of the people in Ballymena who have united together, regardless of religion, to condemn the murder and the bigotry which fuelled it. In an impressive gesture of solidarity, dozens of teenagers donned Celtic and Rangers soccer jerseys in a show of cross-community unity. I've even been impressed with the attitude of Ian Paisley and, despite my feelings on what he has done in the past, I'll give credit to Paisley for deciding to visit the boy's family and pray with them. I note some have criticised him for not attending the Mass itself but considering his religious views that was never going to happen. "The so-called protestors then surrounded and stoned two cars in Ballykeel en route to the funeral of Michael McIlveen, and were heard to shout ‘kill the fenians’." Police confirmed they were investigating reports that a car was stoned near a cemetery in Ballymena, Co Antrim. What a shame that these people could be so insensitive and ignorant. They are a disgrace to the majority of decent unionists who acknowledge that this kind of bigotry is poisoning the very fabric of society in the North. At Michael McIlveen's funeral, Bishop of Down and Connor Patrick Walsh said the people who murdered Michael grew up in "an atmosphere polluted by sectarian hatred". It seems that this hatred still burns strong in parts of Ballymena and it needs to be eradicated. "Michael will not have died in vain if his death leads to a new vision for Ballymena, indeed for the whole of Northern Ireland. "Even in the past week, there have been signs of new relationships, dialogue between those who formerly would not speak to each other, a reaching out in love across the divide." Indeed, and it's a good start. Clearly though more needs to be done and hopefully the impetus will be there to continue building bridges. There's something very wrong when in this day and age people are feeling "under siege", when we have designated republican areas and designated loyalist areas, where we have "peace walls", which to me is a blatant oxymoron, and so on and so on. The North needs to move out of the dark sectarian abyss that has engulfed it for so long. It won't be easy and it won't be done overnight but the actions of everyday nationalists and unionists coming together to denounce bigotry in all its forms will help bring brighter days to NI. I truly hope this happens and I hope that some good can come from this evil, abhorrent act.